This is a bit bonkers I know, but I’m sat here watching a Jason Segel movie on Netflix called Jeff, Who Lives at Home about a guy who keeps looking for signs telling him what he should do with his life. He goes out to the hardware store and helps an old lady onto the bus and for a brief moment you see the street sign behind him – Ridgeway. 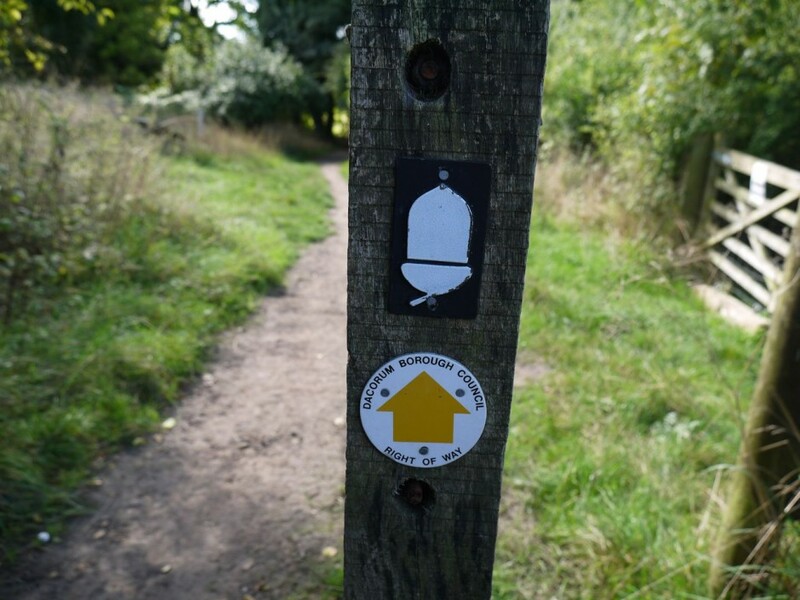 I instantly see it as a sign, a reminder that I need to write this blog about the walk I did in late September last year along the Ridgeway from Tring, over Pitstone Hill to Ivinghoe Beacon. I was going to do this before I started watching the movie but got stuck on how to start – I must have know a film about a guy who lives in his Mum’s basement would give me inspiration. 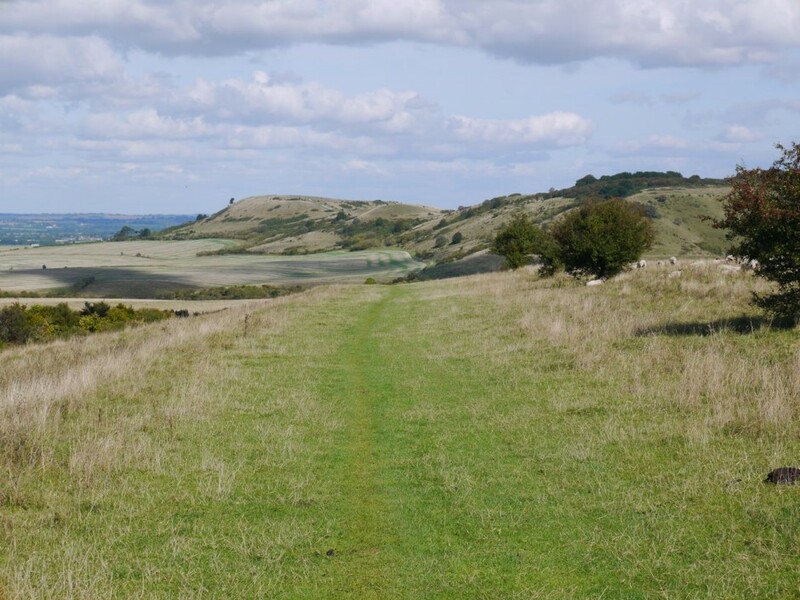 The walk was inspired by seeing a photo of the footpath running over Pitstone Hill – a white way carved out of the grass covered chalk ridge with the lowlands far below. 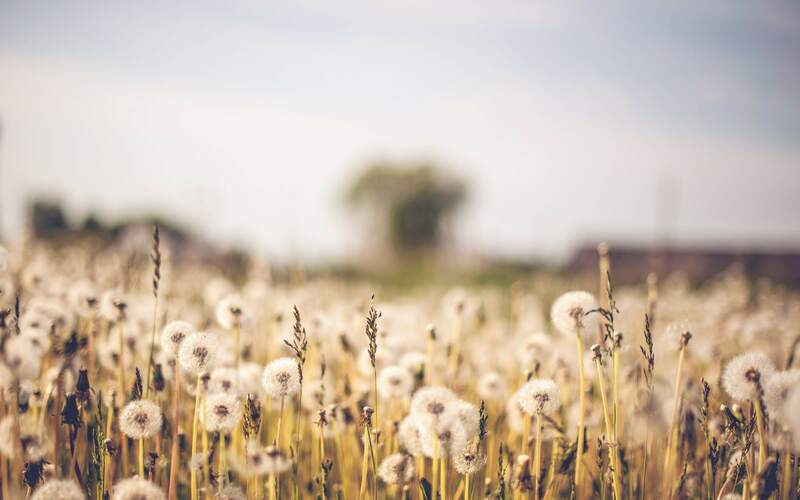 It called out to me sat in my box room in East London, summer in final decline, the last chance for a venturing out in the long days before winter drew in. One late September Friday after dropping the kids at school I boarded the train at Euston bound for Tring, soon sliding through Wembley, then Harrow and Bushey under a clear blue sky – perfect walking weather. I’m carrying too much stuff in my battered old backpack, which is a bit too heavy. I’m packing 3 cameras and 2 jackets somehow. The 3 cameras I can just about justify, the extra jacket has me flummoxed. But by the time I’ve turned up the track onto the Ridgeway my mind is clear for the way ahead. I first planned to walk the Ridgeway while I was backpacking in the mid-90’s, catching the bug after jungle trekking in South East Asia. My Dad had talked about it throughout my childhood in South Bucks with the Ridgeway passing no more than a few miles from our home. But somehow we never got round to it, children arrived, and as the old man advances into his 80’s the talk has diminished. But just seeing the first sign for the Ridgeway sparks something inside. 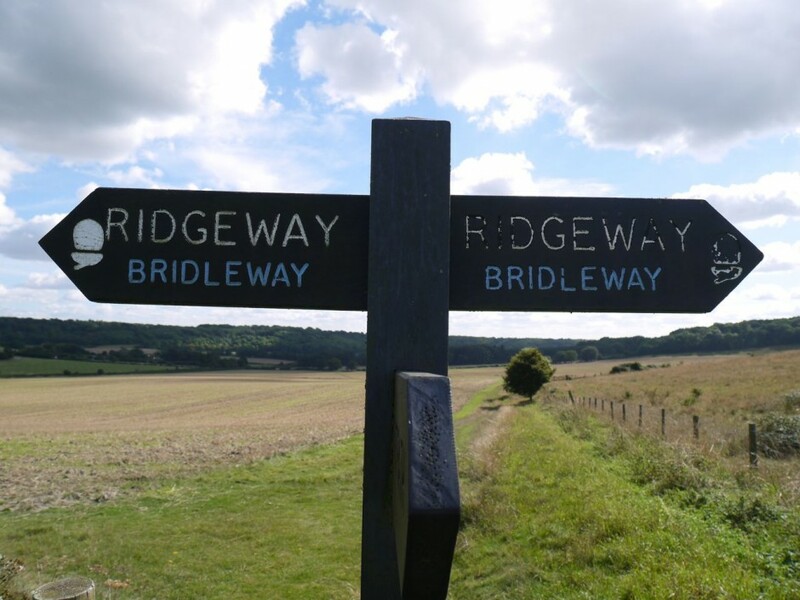 The Ridgeway forms part of an ancient long distance path thousands of years old, the oldest prehistoric track in the country running between Overton Hill near Avebury in Wiltshire and Ivinghoe Beacon in the Buckinghamshire Chilterns. I walked a mere fragment of its 87 miles, but sitting here now 7 months later every footstep lingers in the mind. I passed over Grim’s Ditch, a 20-mile long Iron Age earthwork, at the bottom of a steep wood where I also searched for the tumuli marked on the Ordnance Survey map – spotting two mounds in the undergrowth that reminded me of a tumulus I’d seen in the Upper Lea Valley. As the path continues through Aldbury Nowers you get that sense of the travelers that have passed this way over millennia. Today most of my fellow walkers appear to be retirees out with their dogs for a morning stroll, vigorously healthy pensioners wearing performance sportswear. It’s a beautiful hot day, the burning out of summer; the two jackets seem even more of a folly than they did on the train. I rummage around in a deep hollow formed by a pre-Roman flint mine, where chalk and flint still litter the grass. 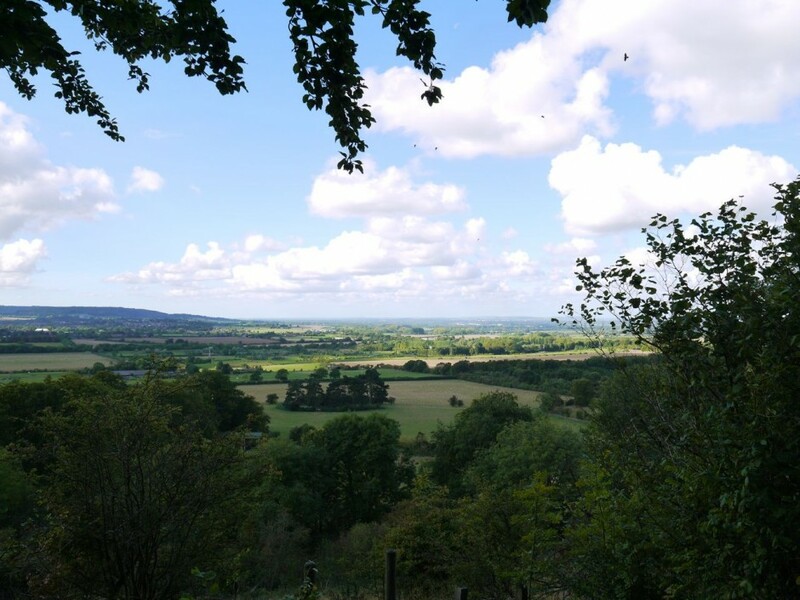 It is a majestic spot looking out over the valley floor towards Aylesbury. I probably linger too long gazing at flints and admiring the view, checking archaeological notes and attempting to walk around the perimeter of the ‘Citadel’. 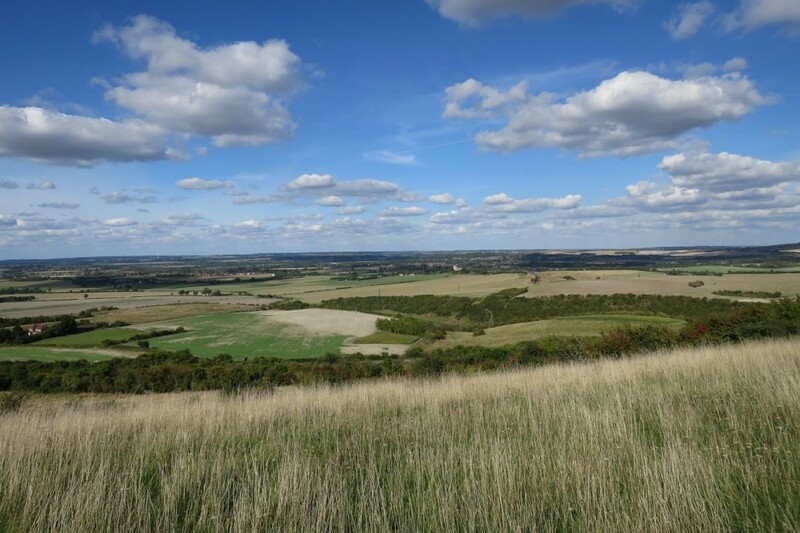 Ivinghoe Beacon rises majestically in the near distance – the Ridgeway snaking along a green spine. It leads me around the edge of Incombe Hole – a deep sided hollow way, possibly a prehistoric boundary marker or ‘linear earthwork’. Breathtaking views stretch out in all directions. I rest on the side of Steps Hill and shoot a timelapse of Beacon Hill and the southeast facing tumulus before my final ascent. 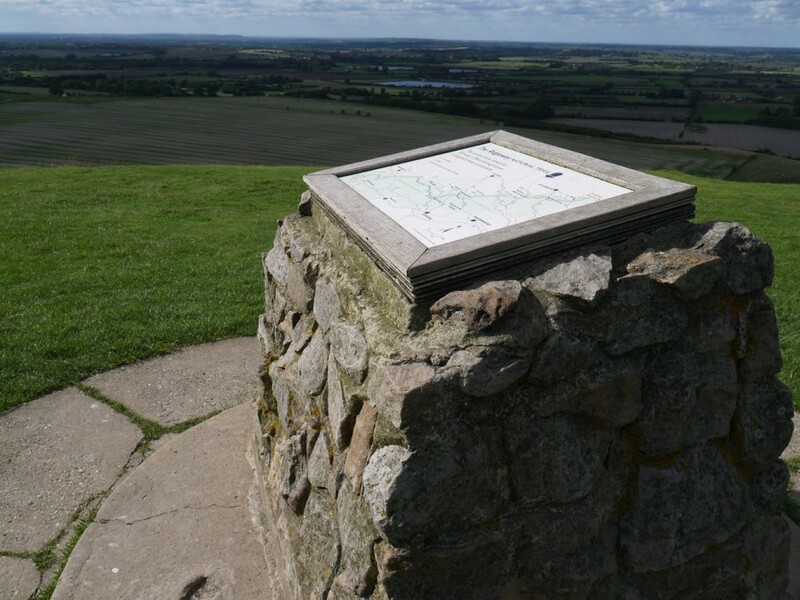 It’s an odd sensation to summit Ivinghoe Beacon at the midpoint of a relatively short walk rather than the conclusion of an 86-mile yomp from Wiltshire. As people arrive at the stone plaque at the top of the hill I try to ascertain whether they’re completing a Ridgeway thru-hike but don’t observe any obvious signs of celebration. I vow to come back here to start a walk along the entire Ridgeway, fulfill the plan I made those 20-odd years ago. 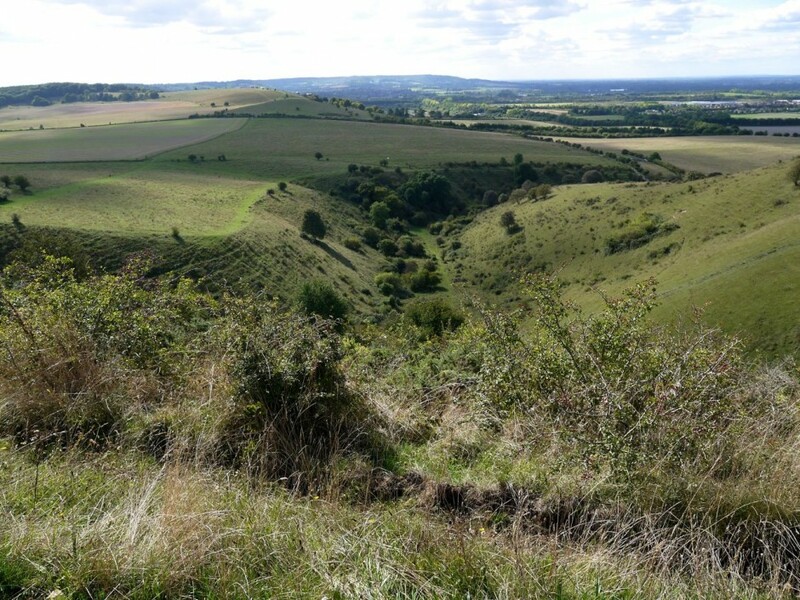 It was difficult to wrench myself away from the stunning views spreading out in all directions from Ivinghoe Beacon. 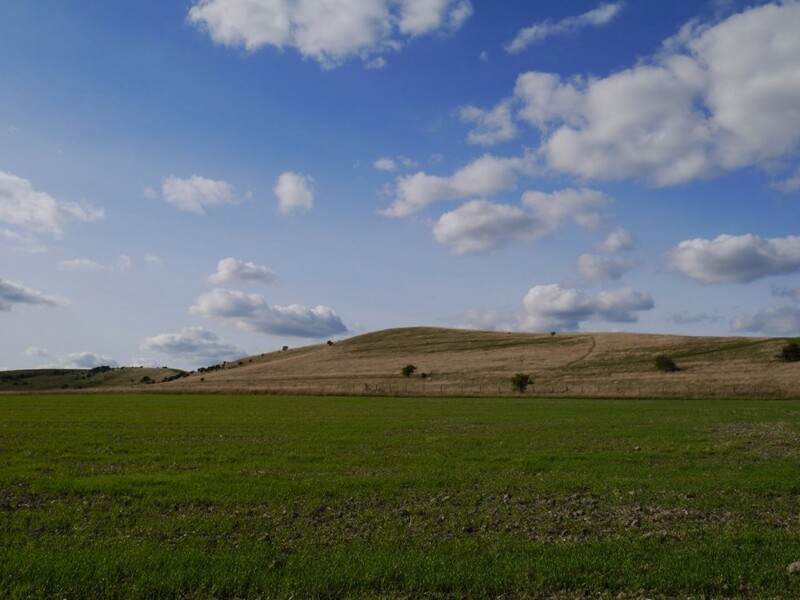 A tangible sense of ancient history is present – it’s said to contain remains of one of the oldest Iron Age Hillforts in Britain with burial mounds dotted around the summit, the surrounding landscape is ridiculously rich in prehistoric sites. I munched on a Marks and Spencer sandwich I’d bought in Euston Station trying to process it all. I’d made no clear plan for the route back to Tring and as was only mid-afternoon, plot a mazy loop through surrounding woodland. The evenings will soon draw in dragging wind and rain with them and memories of these glorious last rays of summer will be rekindled to keep me warm. 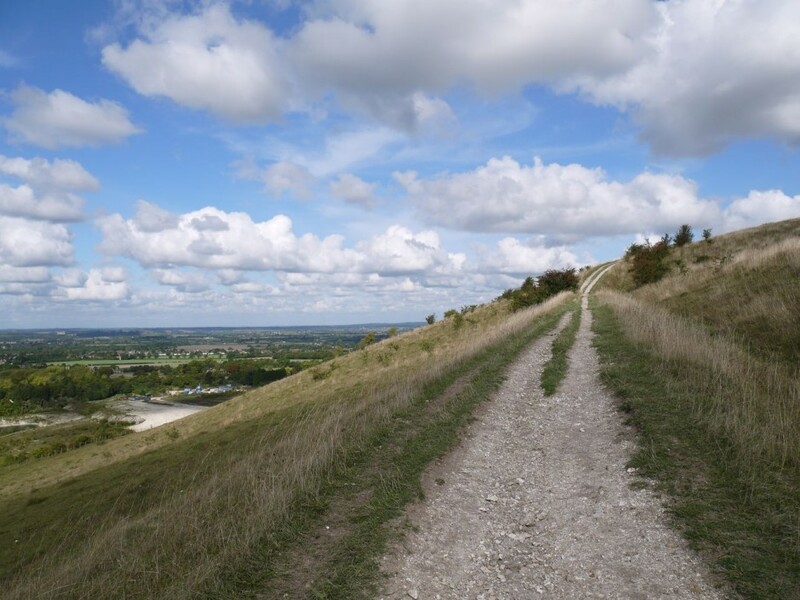 The Icknield Way crosses the Ridgeway just below Ivinghoe Beacon and continues the ancient trackway all the way to the coast – the simple wooden signposts an open invitation to adventure. 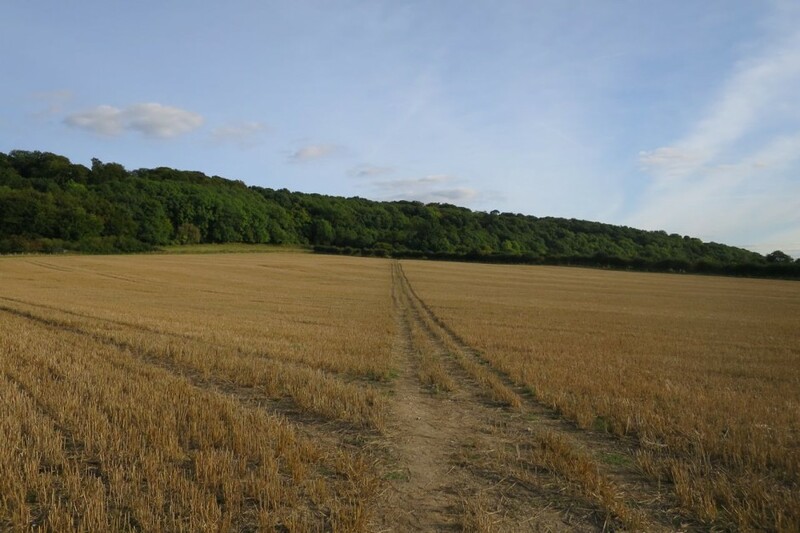 I follow a path along a ridge over the tumulus on Gallows Hill then loop back across farmland to the Coombe. Mid-afternoon I rest beside the footpath on the side of a steep hill reflecting on what has been a classic walk that although the original purpose has been fulfilled I’m keen not to end just yet. Checking the OS map I spot another tumulus in woodland on Moneybury Hill so decide to push on. Entering the wood after crossing a field of stubble I clamber up a high bank which sharply falls away into a deep-sided ditch. Rising on the far side appears a mound in the trees. The ditch has the clear look of a human intervention, like the outer-rim of a defensive earthwork, boundary marker, or holloway. 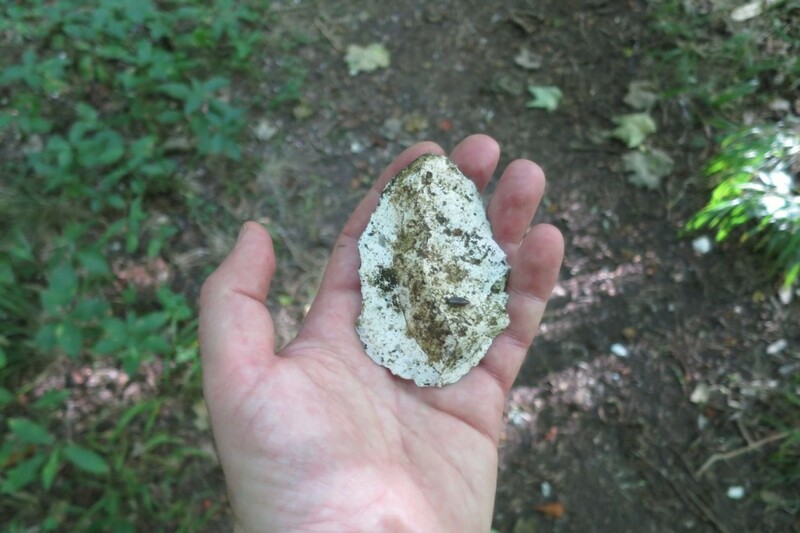 I continue along a narrow path that runs along the high outer ridge of the ditch and find a shard of flint shaped like an axe-head or hand-axe. A tall tree has fallen across the ditch. 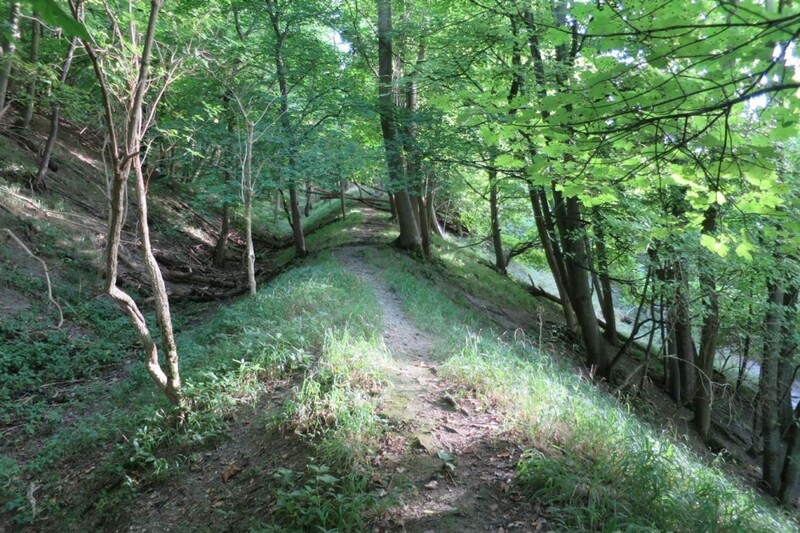 It’s a dramatic prehistoric landscape hidden away on the edge of this large tract of woodland. It is a majestic find in the last light of summer. At the far end of the path there is a small plaque confirming the ditch’s prehistoric origins, explaining that it was carved out over time by herded animals led this way to feed on grasses and acorns. There is another, smaller burial mound near the carpark of the Bridgewater Monument – a towering granite column standing on a York Stone base raised in 1832 in memory of the Duke of Bridgewater who had lived at Ashridge. After taking refreshment in the café I make my way down wooded paths to the Valiant Trooper in the village of Aldbury. Supping a pint of Chiltern Brewery Bitter in the beer garden I reflect that I have been royally rewarded by the walking gods for pushing those last 2 hours. I check the flint axe is still in the front pocket of my bag before drinking up and making my way over a damp stubble field back to Tring Station.